25Mhz MC68LC040 on a 25Mhz, 32bit bus. LC model 040s contained no FPU. 8k of L1 Cache is divided into 4k of Data and 4k of Instruction cache. There are no other caches standard. L2 cache is possible via a PDS card. The Apple supported maximum is 36Mb, but larger SIMMs work. Lowend Mac states that up to 128Mb may be used, with some limits on RAM type - apparently Q605s work with all single-banked SIMMs. Note that single-banked is a logic-level simm trait, not a physical one. Single-banked SIMMs may be either single or double sided. Curiously, the DJMEMC memory controller used in 605's predecessors, the 610 and 650 will only recognise SIMMs up to 32mb, while the newer MEMCjr used in the 605 recognises the larger sizes. Two VRAM sockets can take either two 256k 80ns VRAM SIMMs, or two 512k 80ns VRAM SIMMs. One 512k and one 256k makes a mess of the display :). Resolutions/Colours available with the two VRAM configurations are shown in the table below. One LCIII style 030-compatible PDS. This is not a true Processor Direct Slot, but emulates the 68030's slot. Due to the LC PDS being so succesful in earlier LCs, and with many expansion options having already been manufactured Apple decided to keep the same slot type in these 68040 machines. While the 605's PDS is mostly 030-compatible, expansion cards made specifically for 030 processors will not work, such as 68881 or 68882 FPUs. One 50 pin internal connector, and one 25-pin DB25 external connector - both on the same SCSI Bus. SCSI is provided by a NCR 53C96 controller, which can achieve up to 5mb/sec with a fast enough drive. One DIN-9 Modem port. Similar to the Printer port, but the extra pin supplies +5v power from the ADB power supply. Apple recommends no more than 100mA should be drawn from this supply. 1 port for keyboard/mouse. Power can be drawn from the ADB port, Apple recommends no more than 200mA total is drawn. 1.4 MB SuperDrive, manual inject. 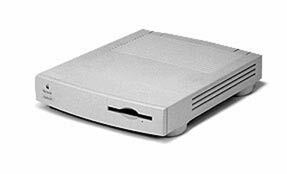 One Low profile 3.5" 50-pin SCSI Bay. In - line-level. The input socket is a stereo socket, and can input two channels of a stereo signal - however these are mixed and only accessible to the hardware as a combined mono 8 bit signal. An Apple PlainTalk Microphone provides line-level input, by using a longer 4-contact plug which receives power from a 5v supply within the input jack. Other microphones only give a mic-level input, and just plain don't work. Recording is possible at 11k or 22k samples/second, with filters applied at 3.5Khz and 7kHz respectively, while recording. 30 Watts standard, but many 2nd hand machines come with replacement PSUs, either third party, Apple replacement or stripped from earlier LC models. Some of these go up to 45 Watts. 605s take a lithium half-AA cell 3.6v battery. If the battery is drained, the video will NOT start up. To succesfully start up a 605 with a flat or missing battery, turn it on for a few seconds, then turn off then on quickly. This leaves enough charge somewhere in the system for video to start up. Versions of System Software below 7.5 require the use of System Enabler 065. The System Enabler should be installed the System Folder. Some earlier models also contain a ROM SIMM socket, located just to the right of the VRAM socket. No SIMMs containing ROMs were made for this slot, and many boards only contain the solder pads indicating its position. The ROMs as used are 2 surface mount chips located directly behind the CPU. If a Q605 is running System 7.1, overclocking it from the standard 25Mhz to 33Mhz will change the gestalt ID, but won't cause problems with the OS. Underclocking however, to 20Mhz will leave change the gestalt ID to one the system doesn't recognise as compatible, and the system won't boot. System 7.5+ isn't affected by this. The keyboard power-on key, marked , will not start up a Quadra 605. Only the power switch at the back will do so. Pressing the power-on key while running is the same as selecting shut down. Once a 605 has shut down, it will ask you to manually turn it off. Quadra 605s have no reset button or programmer's button, but keyboard key combinations can perform the same functions. To reset, hold down the Apple, Option and Power keys. For a programmer's button press, hold down just the Apple and Power keys. Apple Computer Specs - Information from apple.com on specs of all released products. Applespec Database - Downloadable filemaker-pro database (standalone and data files available) with info on -everything- apple. Lowendmac.com - Excellent resource with technical information and articles on using older macs. Everymac.com - Specs and info for every model macintosh and mac clone. Apple-history.com - Museum with information on all macintosh models. pickle's macfaq - Frequently asked questions about getting older macintoshes up & working.